Alpine meadows are home to some of the most vibrant and colorful collections of Colorado wildflowers. A wildflower hike through these meadows, including Roxborough State Park near Denver, can be one of spring and summer's most serene adventures. On Colorado's eastern plains, wildflowers begin to spread their petals in April and May. But in the Rocky Mountains in western Colorado, where snow often doesn't melt completely until mid-June or later, wildflowers usually don't pop up until July and August. This late bloom means that the colorful display is often concentrated and profuse. At altitudes ranging from 8,500 to 14,000 feet, the pinnacle of this blooming season is usually around the Fourth of July. Red rocks and wildflowers dominate the landscape of this 3,245-acre state park, where the ecology is diverse and unique. This area is known as a transition zone — a location that encapsulates the natural transition of the plains' rise into the dramatic heights of the Rocky Mountains. Because of this varied environment, certain types of wildflowers usually found miles apart can be seen growing close to each other. This park is popular because of its proximity to Denver. As a day-use park, it’s ideal for getting away from city distractions and reconnecting with the serene beauty of Colorado wildflowers. 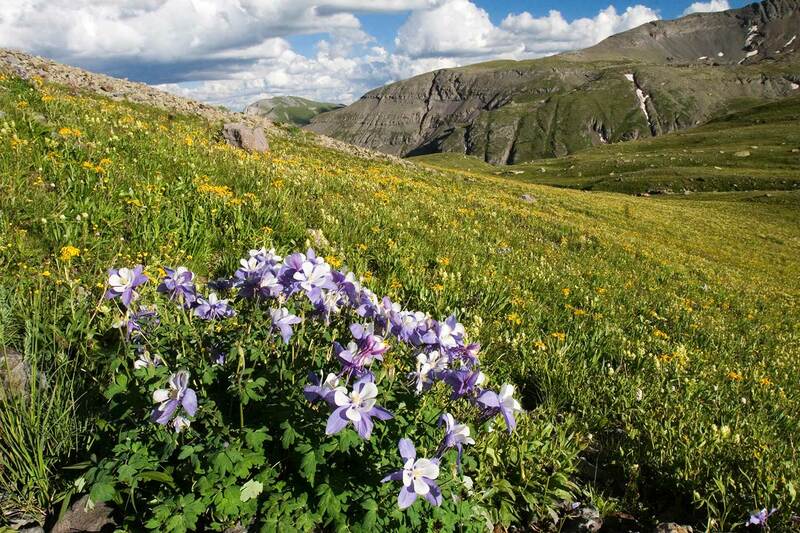 If you want to view wildflowers in Colorado’s true wild, then you need to take the Alpine Loop Scenic Byway. Accessible only by a four-wheel-drive vehicle with high clearance, this rugged country serves as the perfect growing grounds for a multitude of wildflowers. It is important to stay on all designated roads at all times — getting stuck is a common occurrence for those who decide to go off-road. The route follows 63 miles of unimproved road and reaches heights of 12,800 feet. There are many hiking spots along the way, so you can get out and take a closer look. Near the Colorado River, you’ll find the Rabbit Valley Recreation Area. In an expanse of 24 square miles, high-mountain desert terrain prevails in the semi-arid climate. Found growing among wind-sculpted sandstone, wildflowers add a welcome burst of color. And with the elements to contend with, these flowering plants are as hearty as they are colorful. The Bureau of Land Management operates this area, where you can enjoy wildflowers in a multitude of ways. Take a horseback ride through the area and get a view of the sweeping panoramas while atop your mount. Or hike it yourself on the area's many miles of hiking trails. Then relax after a long day at one of three designated campsites. Development and industry have been kept at bay in this naturalists' paradise. Many of the vistas in the area display what the first European settlers of the land saw: perfect, unadulterated Colorado prairie. In addition to vibrant wildflowers, you may also spot a bald eagle or hawk — common visitors to the area on their hunt for prey. The paved Fossil Creek Trail is an easily walked 2.4-mile trip through the prairie. Meandering along this path will bring you to a number of interpretive signs providing information on the terrain. The most defining feature of this area used to be the granite hoodoos and rock arches. Today, it’s a blooming landscape healing from wildfire. The infamous 2002 Hayman Fire left a lasting imprint on the more than 100,000 acres it touched. Within clearings of the charred remains of a scorched forest grow a multitude of wildflowers — proof that from destruction grows beauty. Fortunately, the fire did not spread to the entire region. Lush green hiking trails stand in stark contrast to those that were burnt. Plan a two-day camping trip to enjoy the scenery of this area. The trails near Goose Creek offer primitive tent-camping sites. Nearby City: Deckers on Highway 126. Turn west on Matukat Road for roughly eight miles. Check out 5 More Colorado Wildflower Hikes, Easy & Popular Hikes and Colorado Hikes and Hot Springs.